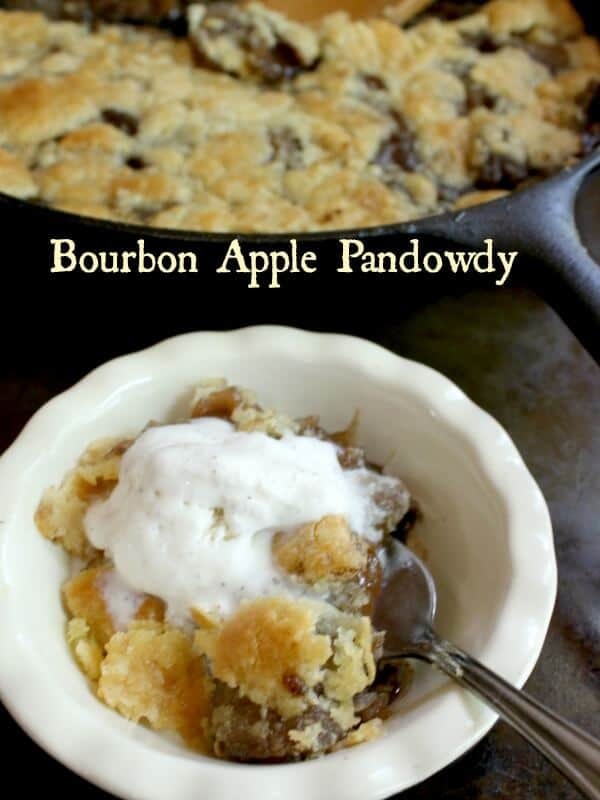 Bourbon Apple Pandowdy is something like a pie, something like a cobbler, and totally unlike anything you’ve ever eaten. A thick layer of tender apples is simmered in a bourbon and cinnamon spiked sugar syrup with a little chipotle to kick up the heat. Then strips of buttery pastry are dropped on top and the whole thing is baked. Partway through you push the pastry down into the apples so that it soaks up all of that sweet and spicy sauce. Served warm with vanilla ice cream it is unbeatable. Yeah. I think this is more of an autumn dessert than a summer one. I totally agree with you — I am crazy. In my own defense with all of this rain that we are having it’s much more like autumn here than like summer. Our temperatures are down right chilly for the last week of May in Dallas. Six Flags is underwater, it’s too cold to go to Hurricane Harbor, and the crops can’t set fruit because of all of the rain. Chilly (anything under 80F in Texas is chilly), dreary, rainy days call for warm, comforting desserts — like this old fashioned, bourbon apple pandowdy. What is a pandowdy you ask? Well, some would say that it’s a dessert born in Colonial America, made of apples and dough but I say it’s a godsend for those who can’t get a pie crust on to a pie without it falling apart. There is no bottom crust and the top crust is cut up pie dough or biscuit dough. This recipe uses a tweaked pie dough that bakes crisp, buttery, and crumbly. 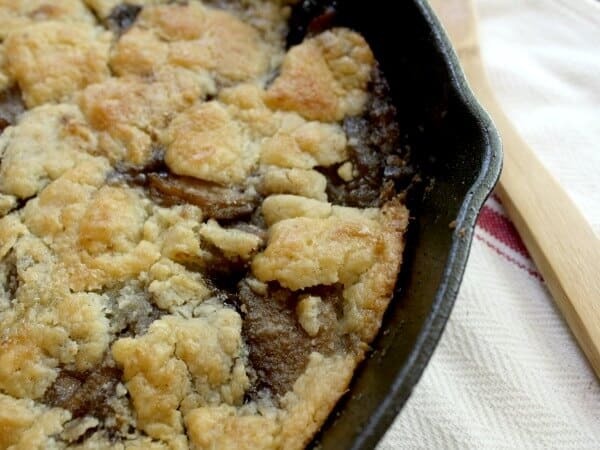 It’s made in an iron skillet where the apples are simmered in a rich, flavorful sauce before the pastry is put on and the whole thing is baked. When it comes out of the oven the crispy pastry is swathed in the thick, spicy sauce so every bite is crumbly-crispy and tender-sweet. The tiny bit of chipotle I add sort of kicks you at the end of the bite just to let you know it’s in there. It is not a beautiful dessert but it is a comfortable one. While Anne Shirley would have certainly eaten it Jay Gatsby never would have. 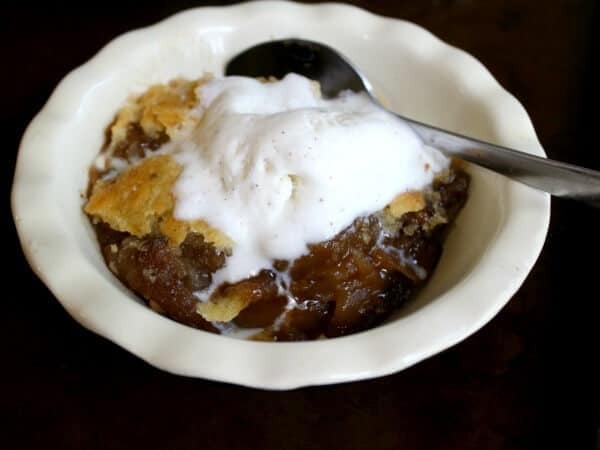 Bourbon Apple Pandowdy, served warm with a scoop of vanilla ice cream is comfort food in the strictest sense of the word. The following is an affiliate link. If you click through and buy something I will get a small commission which helps keep the blog up and running. Thank you so much for being a part of Restless Chipotle! Tangy apples are simmered in a spicy sweet sauce and then baked with buttery squares of crust. Something like a cobbler or an apple pie but so uniquely good! Add the flour, butter, sugar, baking powder, and salt to a food processor bowl. Process until the mixture is crumbly. Add the water and pulse until the dough forms a ball. Pat the dough into a disk and wrap in waxed paper. Add the 1/2 cup butter, bourbon, sugar, dark brown sugar, cinnamon, cloves, apples, and chipotle to a 15-inch cast iron skillet. Simmer, stirring occasionally, for 10 to 15 minutes, or until apples are tender. Roll out the dough about 1/8-inch thick. Drop the squares on the simmering apple mixture. Brush with cream and sprinkle with sugar. Push the dough gently into the apples mixture. Bake for 20 minutes more, or until crust is crispy and golden. Marye, I’ve never had or heard of a pandowdy before and I must say, I love it! I’m not the best at pie crusts either so this would definitely work for me – besides – it’s laced with a combo of chipotle and bourbon! How amazing is that combo! Such a comforting dish and so totally decadent too! Never heard of a pandowdy before, but I want one now! 🙂 Oh they are so good! You would love this. It’s so good!